Understory tree with toothed leaves, finely scaly grayish bark, and hop-like fruit; growing east of the Great Plains in hardwood forests. Note: Common names for this tree and Carpinus caroliniana are confusing. Both trees are sometimes called "ironwood" or "musclewood," and Carpinus caroliniana is often called "hornbeam" (without "hop"). While the leaves of these trees are similar, they have very different (and very distinctive) bark. 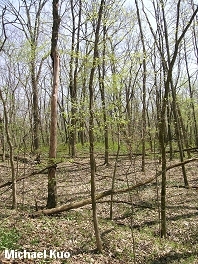 Habitat: Usually in dry areas, on slopes or ridges; under canopy trees in oak-hickory and southern hardwood forests. Stature: 20-40 feet high; to 1.5 feet in diameter; with a rounded crown when mature. 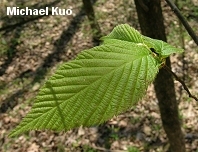 Leaves: Candle-flame-shaped; 3-5 inches long; finely, doubly toothed; dark green above; paler green below; symmetrical at the base (unlike the leaves of elms); the bottom lateral veins often forked (unlike the leaves of Carpinus caroliniana). 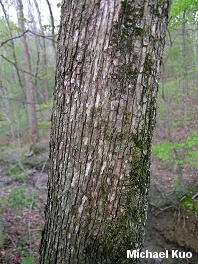 Bark: Gray; finely scaly in longitudinal strips, appearing "shreddy." 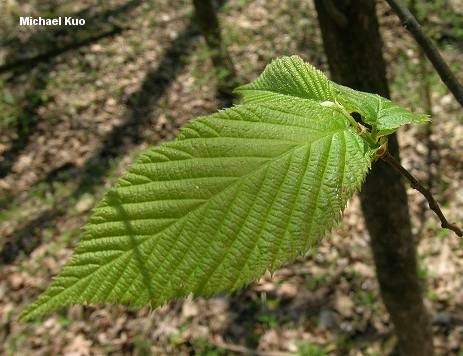 Aleurodiscus oakesii is fond of hop hornbeam bark. I have found many yellow morels under hop hornbeam, though I concede that white ash, a renowned morel associate, has usually been present as well.